Play boxing games by throwing real punches - but don't let your gran get in the way! While the Nintendo Wii's revolutionary controller has changed the way people think about games, one Israeli company is trying to take things a step further. It's developed a new 3D camera lens so powerful it can track every tiny movement you make. It's called the ZCam, and has been in development at 3DV Systems' labs for two and a half years. 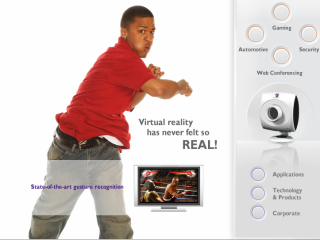 It's similar to the PS2's EyeToy but is far more sensitive and intelligent. It will enable you to play games using very subtle movements such as the flick of a finger. "The Wii has shown us the way, but this device can take things so much farther," 3DV chief executive Zvika Klier told Reuters. The ZCam will allow you to play games by physically replicating the movements of the characters on screen. So instead of playing basketball by pressing buttons on a control pad, you will actually be able to shoot hoops as though you were playing with a real ball. Klier says he's currently negotiating with several hardware and software companies about ways the ZCam can be used. And assuming it finds partners who are willing to develop games and other software for it, the ZCam will go into mass production at some point next year. The ZCam will eventually be available as a peripheral but it's unclear which platforms it will be offered on. It's perfectly possible that it'll be available on both the PS3, Xbox 360 and PC, with cross-platform games being designed to make use of it. However, there are a few things that make that outcome unlikely. Sony has recently launched the PlayStation Eye - the PS3's improved version of the EyeToy. It's unlikely that Sony would want to allow a third-party peripheral to come in and steal the show. The Xbox 360 also has a similar camera peripheral. So some hard bargaining will be needed from 3DV Systems if it's going to get its ZCam into bed with those two consoles. And the Nintendo Wii isn't powerful enough to handle that kind of image processing. The ZCam is not the only interesting piece of technology coming out of Israel at the moment. Israeli firm Mempile is currently working on a new optical disc format that will see 1TB of data being stored on one disc.